A butterfly flapping its wings in Brazil can produce a tornado in Texas. The author of this poetic image was Edward Lorenz, a meteorologist who in 1972 explained how small changes in a system as complex as the atmosphere can generate large effects. This expression was a huge success and since then has often been used. Two million years ago, in the middle of the Pleistocene, a population of African apes lived astride the border between two worlds: the old world of the forest and the new world of the grasslands. They were Australopithechi, “southern apes”, which had recently climbed down from the trees but were already able to walk as bipeds, just in a way that was a little more ungainly than we do. They had their feet on the ground but their paws still on branches because trees remained a safe refuge into which they could climb to rest and to escape the large felines of the time, huge and ferocious beasts like the sabre-toothed cat (Homotherium crenatidens), the Megantereon, cousin of the sabre-toothed tiger and the worst of all of them: the Dinofelis, literally meaning “terrible cat”. It seems that the incisions found on the fossilised bones of some Australopitechi were the result of attacks by that prehistoric leopard. 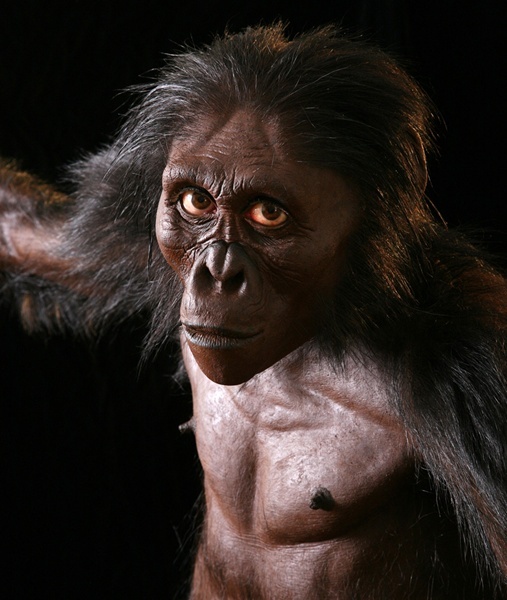 The most famous Australopitecus is Lucy, a young female who lived just over three million years ago, discovered in Ethiopia in November 1974. Lucy who walked in the sky with diamonds in reality is called “A.L. 288-1” but owes her nickname to “Lucy in the sky with diamonds” the Beatles song that was playing on a radio in the excavation site. It appears that she fell from that sky and was shattered on the ground. According to research in 2016, Lucy’s bones show the signs of a fatal fall, probably from a branch 12 metres above the ground, more or less equivalent to a fall from the fourth floor of a building. Poor Lucy died almost immediately. In an almost stable world, Australopitechi lived in harmony with their environment for two million years. They were vegetarian but they rummaged through the rubbish of predators to give themselves the luxury of meat every now and again. They were not overly intelligent and did not bother to invent anything more than the simple tools that their chimpanzee cousins already used. In short, they were not interested in becoming more human and would have carried on in this way for millions more years if a butterfly had not flapped its wings on the other side of the world… Two and a half million years ago, a fragile strip of sand united North and South America; the Panama Isthmus separated the oceans and prevented the warm waters of the Atlantic from entering the Arctic Sea. The polar icecap began to expand and the Ice Age began. A domino effect disrupted the climate: Europe and North America covered by ice, icebergs drifting along coasts where we now go on holiday, winds changed their course and with them the distribution of rain also changed. The African climate became dry, the Sahara expanded and the forests shrank. The border world of the Australopitechi disappeared. On the one side was extinction, on the other evolution: fortunately for us they “chose” the second option.